Established in 2013, the Arod Quartet came to the attention on the international stage when they won First Prize at the prestigious ARD International Music Competition in Munich, having already taken First Prize at the Carl Nielsen Chamber Music Competition in Copenhagen in 2015. In 2017, they were appointed BBC New Generation Artists. 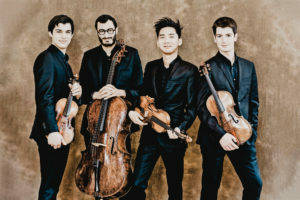 The 2017-2018 season saw the Arod Quartet perform at the Auditorium of the Louvre, the Philharmonie de Paris in their native France, as well as London’s Wigmore Hall, Salzburg’s Mozarteum and the Schloss Elmau in Germany, BOZAR Brussels, Wiener Konzerthaus, Het Concertgebouw Amsterdam as well as in Italy, Tokyo, Denmark and Serbia. The quartet has been invited to perform at several international festivals: Verbier and Montreux (Switzerland), Aix-en-Provence, Menton, Salon-de-Provence, Folle Journée de Nantes, The Pablo Casals Festival of Prades (France) as well as Heidelberg, Rheingau, Mozartfest Würzburg, Prague Spring Music Festival amongst others. The quartet are invited to perform alongside artists such as violists Amihai Grosz and Mathieu Herzog, clarinetists Martin Fröst, Romain Guyot and Michel Lethiec, pianists Eric Lesage and Alexandre Tharaud, and cellists Raphaël Pidoux, and Harriet Krijgh. The Arod Quartet studied with Mathieu Herzog, Jean Sulem and Artemis Quartet at the Queen Elisabeth Music Chapel in Brussels. They have also worked with the Ebène Quartet and Diotima Quartet. In 2017, Quatuor Arod signed an exclusive recording contract with Erato, with a first album of Mendelssohn quartets released in 2017. The quartet is in residence at the Fondation Singer-Polignac and at ProQuartet – CEMC. Mécénat Musical Société Générale is the quartet’s principal sponsor, and the ensemble was the 2016 HSBC Laureate of the Académie du Festival d’Aix-en-Provence. Quatuor Arod is also supported by ADAMI and the Région PACA.